Programmable for a wide range of precision medical devices that may require high resolution machine vision camera inspections, laser measuring and gaging, or laser surface profiling, this machine is incredibly flexible. 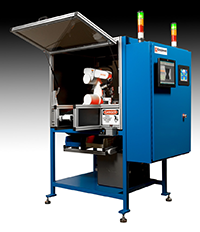 The base machine includes a Denso articulated arm robot, part gripper, machine vision camera and/or Keyence laser measurement device. Also included are 1 or more part in-feed conveyors with flexible nest designs, internal part inspection nest(s) with stepper and servo controlled positioning, good and bad parts containment bins, AB PLC and user friendly 8" color touch screen HMI operator interface. Optional items include: bar code scanner for part # and/or quantity entry, custom HMI screens for operator password entry and/or logging, Industrial PC for inspection results data collection, Gage R&R and system validation technical support services. The compact machine is supplied with casters for quick and easy placement in the required work areas.